Buffalo Mountain is one of those beautiful oddities. Right in the middle of 3 cities, stands this tall gorgeous mountain of forest and wildlife. Surrounding it, lies buildings, shopping malls, restaurants, and industry. However, on the mountain this all melts away. 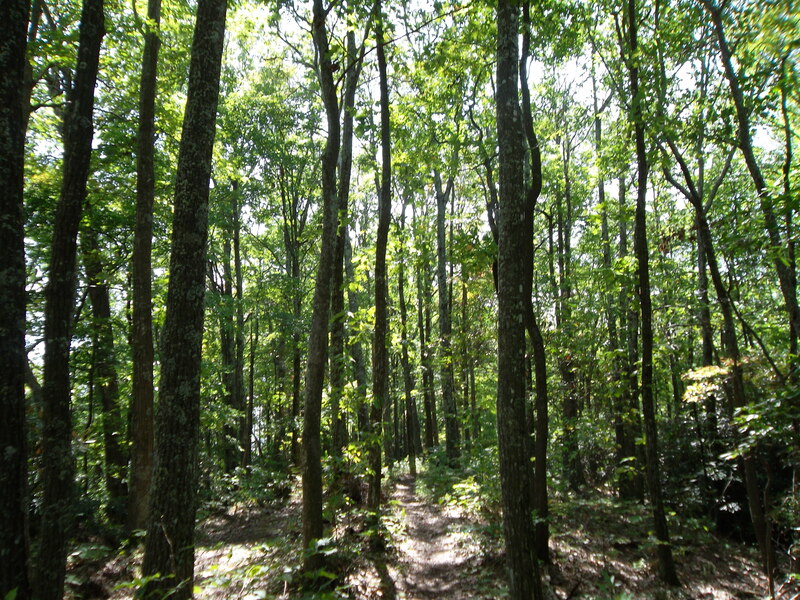 Within minutes of shopping you can have hiking, creeks, wildlife, and solitude. It’s a fairly strenuous trial, although it makes a great 3-4 hour evening hike. Watch for snakes! The trails are numerous, but I prefer a 5.13 mile loop that surrounds the entire park. I’ve provided a GPS map and elevation guide thanks to Backpacker Magazines lovely GPS application. It should help you through. You can upload this trip to the backpacker or trimbleoutdoors app and use it to navigate you through the trail. 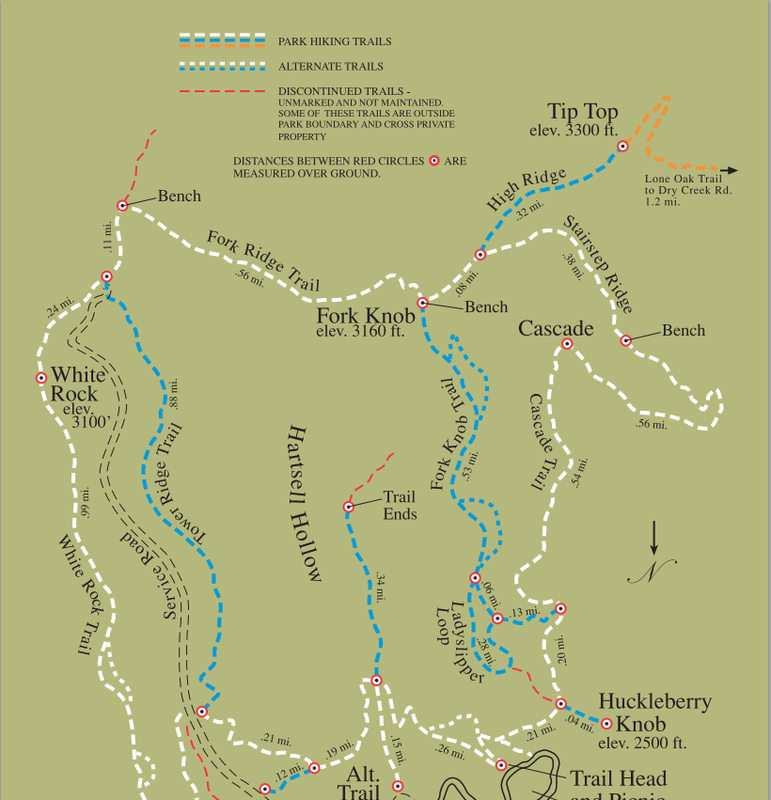 This is the actual park map, showing all the trails on the mountain. Get a map, use the one provide which I made (doesn’t include all trails)or take a legible photo of the mounted map before you head in. It’s a maze up there. You begin at the main trail head entrance. A few feet in you cross a small stream via a wooden bridge, continue up stream and cross back over. From here at the stream you can venture left onto the white trail, which climbs long and steep up the side of the mountain. Look closely or you will overlook the trail that slips inconspicuously into the woods just past the blue trial which heads straight up the mountain. You will cross an access road, but quick reconnect onto the trail a few yards up. Continue along, staying straight at the next intersection of trail. 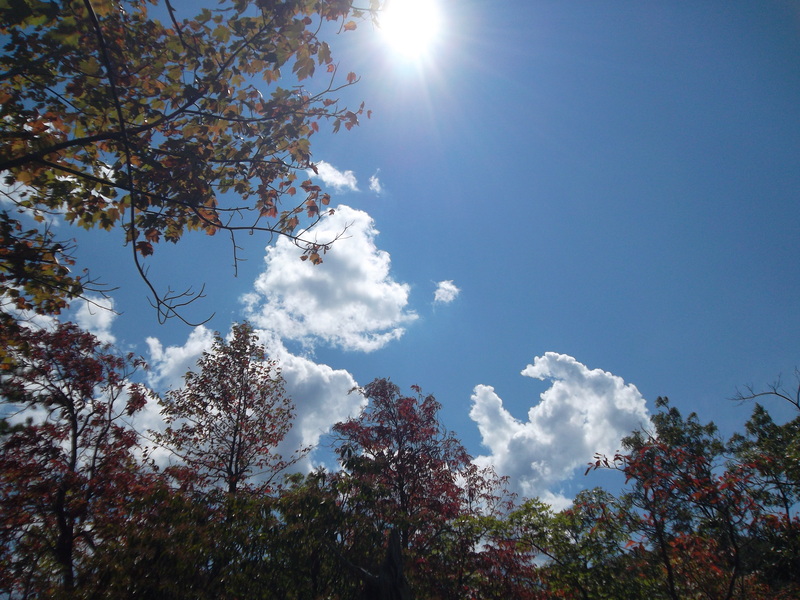 Eventually, you will arrive at the top of the mountain, and are rewarded with the view of Erwin Tennessee. Limestone hangs above and over the mountains ridge. This is called White Rock. Peering into the valley opens up a new view of the city few have had a chance to enjoy. 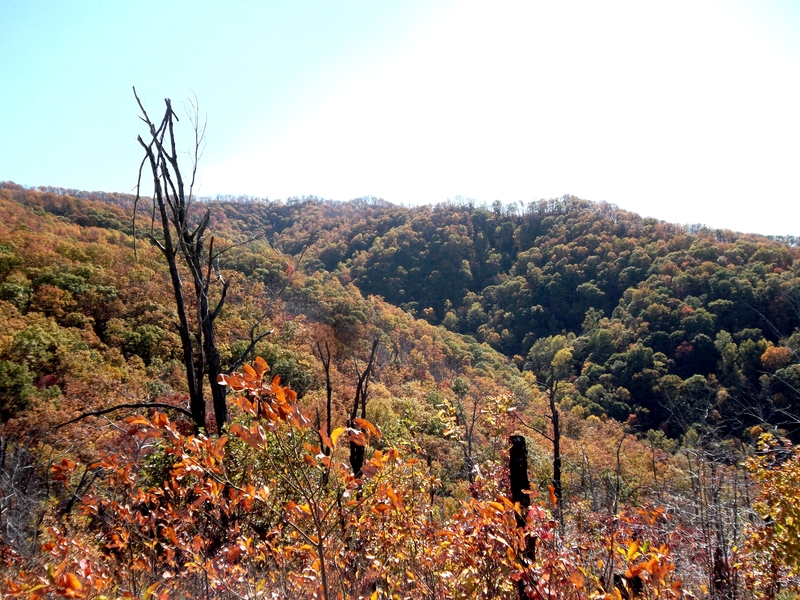 Continue along the ridge, and eventually you will find another taller view of the city below, this is Chimney Top. Further along, you’ll eventually pass a small connecting trial that accesses the radio tower hidden on one of the peaks. Continue straight. Further down the trail, look for a trail that veers right. A sign warning you to stay on trail will salute you. Follow this trail up and down for the next half mile or so. The next fork gives you an option. 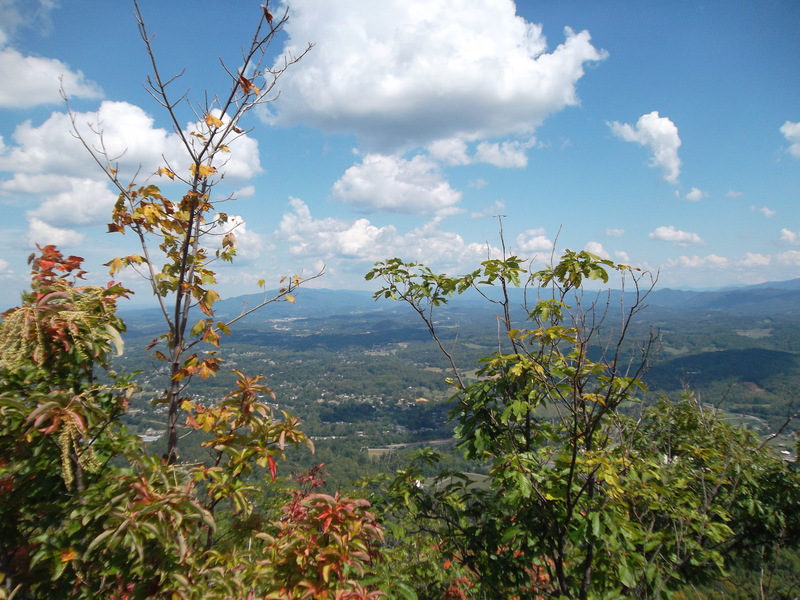 Stay left (recommended) to see Tip Top, a glorious 360 degree view overlooking Johnson City, Erwin, and even Jonesborough and giving a glimps of the Pinnacle Fire Tower in the far distance (another local hike), or you can hang right and continue on the loop. This is your eventual destination. Follow this trail to continue the loop. From here, simply continue following the trails straight. You will eventually make it to another fork, left goes to Huckleberry Knob, which shows of Johnson City from high in the mountain. Eventually, you’ll take the right side to head back to the beginning of the tail. Follow the trail straight, avoiding the side routes that drop you back onto a small road below. Eventually you’ll end up back on the stream that you crossed in the beginning, remember that blue trail? You’re at the access. Hang left and follow the creek back to your destination.